We welcome visitors and tour groups who wish to visit the church building and grounds! The grounds and playground are always open to the public. To set up a tour with your class or large group, please contact the Office Administrator via email. Individuals and small groups are encouraged to view the building on the official architectural tour of Columbus. As a National Historical Monument, North Christian Church is one of the highlights on the Columbus Visitor’s Center Architectural Tour. The Visitor's Center tour of the building is led by a tour guide who is familiar with many aspects of the building's history and construction. Parking is available at the east end of the building. Large tour buses may not drive upon the loop directly in front of the entrance due to an underground structure in that area. 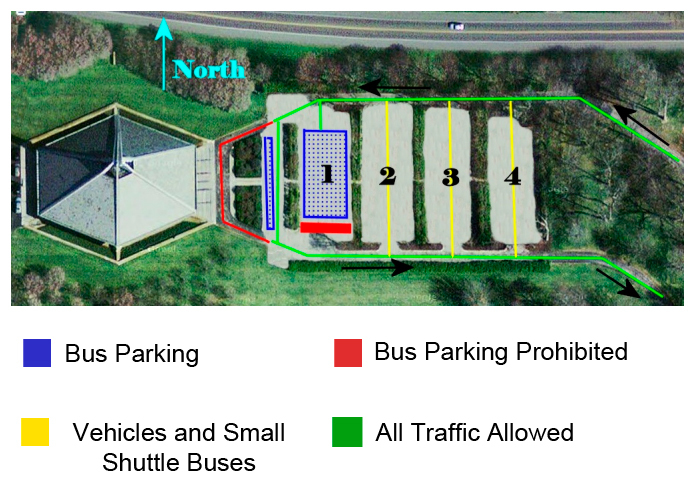 Large tour buses must use specific areas for parking depicted in the picture below.